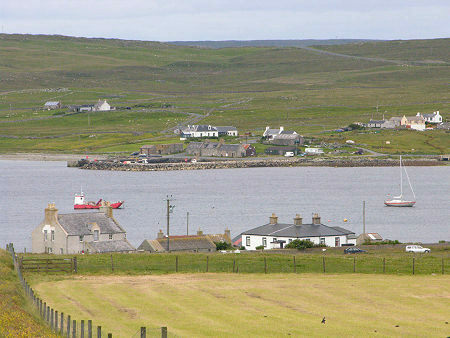 Not far from Unst's ferry terminus at Belmont a side road leads you to the south coast settlement of Uyeasound, a centre for fish farming operations. 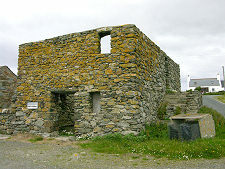 This is built at the head of Uyea Sound, and in the shelter of the island of Uyea. 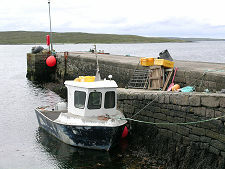 Shops and a jetty are accessed via what must be Britain's most northerly one way system, and on a less gray day than illustrated here this would be an extremely attractive spot. 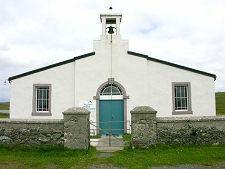 Nearby Uyeasound Kirk is unusual, being broadly based and white-harled, and looking like it belongs more in Mexico than Shetland. From 1877 Uyeasound was served by Earl of Zetland, which carried passengers from Lerwick via Mossbank on Mainland. This same ship operated the service until 1946, when it was replaced by a more modern steamer. However, from 1975 the current pattern of shorter crossings by vehicle ferries had been adopted and the steamers from Lerwick ceased. 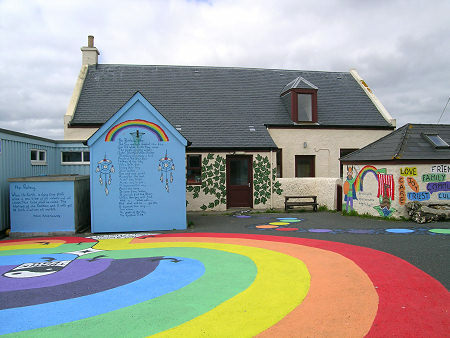 Uyeasound is home to the Gardiesfauld Youth Hostel, one of Shetland's most popular youth hostels bringing a steady stream of visitors to Unst. Close by, overlooking the harbour, is Greenwell's Booth. Now only a stone shell, this was once a Hanseatic trading booth, probably built in 1646 and used from the early 1700s by the Scott family for their trading operations. Last time we looked it served as a store for fish farm floats. It is worth following the minor road east from Uyeasound. This takes you first across a broad ayre separating Easter Loch from Uyea Sound. It then passes through the small dispersed settlement of Clivocast and past a striking, if odd, prefabricated three storey building. 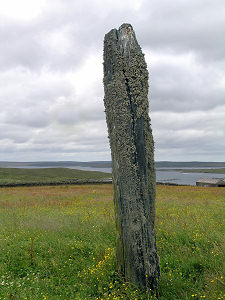 As you climb the hill east from Clivocast, keep a lookout on your right for one of Unst's two standing stones. 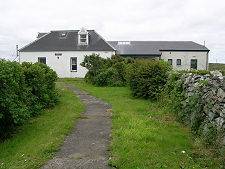 This has a location that commands stunning views to the south across Fetlar and beyond, as well as taking in much of the southern coast of Unst itself. The stone stands an impressive 3.6m high and has probably stood here for something approaching 4000 years. But for the highlight of this trip you need to wait until you are nearing the east coast of Unst. 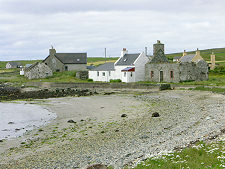 Near the south east tip of the island is Muness Castle. Being on Unst, this is, perhaps inevitably, Britain's most northerly castle. A sign on the gate shows where you can obtain the key for the castle. A walk of a little over half a mile north from Muness brings you to the superb sandy beach at Sandwick, complete with a Viking longhouse now covered by the sands.